2019 gets off to a flying start with wood-working sector innovation, specifically, for the furniture industry. 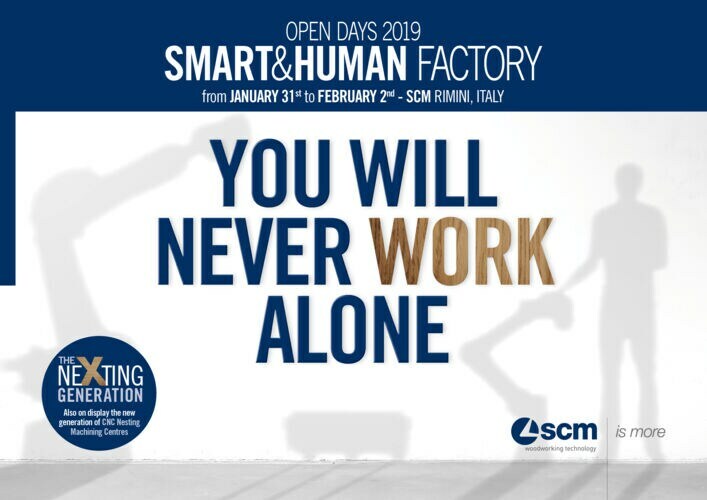 The countdown has begun to the SCM Open House 2019 “Smart&Human Factory”. From 31 January until 2 February at the Technology Centre, Rimini Headquarters, this will provide an exclusive window to the future of smart manufacturing. The event centres around a state-of-the-art production model, with new digital and automation systems. Flexible, modular and easily reconfigurable, these are integrated with collaborative robots and designed to provide an increasingly effective and rapid response to the challenges of mass customization and Industry 4.0. To use the SCM Open House claim, “You will never work alone”: during the event you can witness in real-time a new model of interaction between humans, robots and machines, in open, safe cells. See for yourself the automated production of four different types of cabinets. Discover “friendly” automation, not only making the factory simpler and more efficient, but also bringing progress in how we work: aided by industrial and collaborative robots, plus smart shuttles for logistical handling on the ground, operators are freed from repetitive and low added value activities.